Hi there! I’m John – a behind-the-scenes member of the FightYourselfFit.com & SneakPunch.com team. It’s good to be here! – I hope my progress through the workout will be interesting one – and if not, a good source of entertainment – I’m way out of my comfort zone! 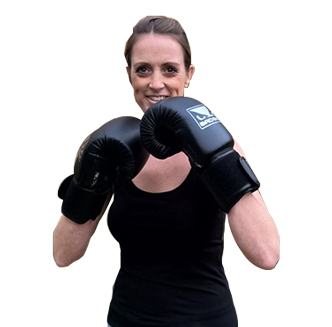 First off, I’m beginning the Fight Yourself Fit 60-Day Punch Bag challenge with zero boxing experience – I’ve had absolutely no previous boxing training whatsoever. Zilch, nada, nothing. Until a few days ago, I’d never worn a pair of boxing gloves or hit a punch bag in my life! – let alone contemplated ‘sparring’ or heaven forbid actually ‘fighting’ in the ring (oh, and that’s never going happen!). 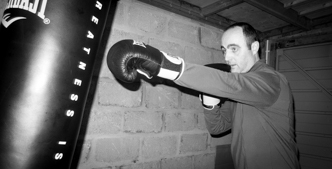 But perhaps like many of you, I’ve had a secret desire to ‘have a go’ at something like boxing – but never taken the plunge and followed it through. I’ve never created the opportunity to pursue it – and at 42 years old, it’s highly unlikely to happen under my own steam. But I have enjoyed a causal interest in boxing, as a spectator, particularly in the 90’s – watching the Bruno, Tyson fights and the British middleweights – Eubank, Benn & Joe Calzaghe. And I remember watching Cornelius fight Steve Collins for the WBO. I admired boxing as a sport and believe the training involved is a huge positive for all walks of life. So, how did this challenge come about? 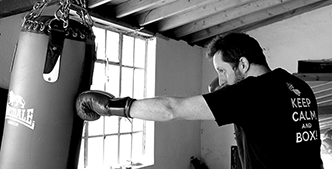 Well, I’ve been friends with Steve for many years, and having met up with Corney in 2012 – we decided to launch SneakPunch.com – with the aim to teach boxing online. It’s been an exciting time, with lots of hard work but great fun, and above all – amazing feedback from all over the world! My role? For the past 3 years, I’ve been working to develop the 2 websites – essentially from behind the camera and in front of the monitor. I’ve spent my time worrying about lighting, camera batteries charging, audio recording and getting the shot in focus – whilst letting Corney, Steve & Rachel get on with the boxing! 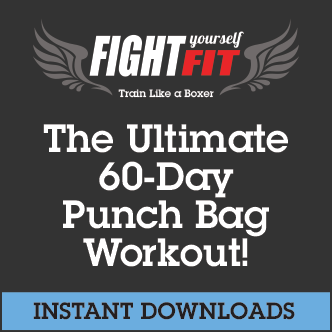 We’ve proved to be a good team – and successfully recorded over 50 ‘How to Box’ videos on our YouTube Channel, added dozens of articles to SneakPunch.com – and now launched the ‘epic’ 60-Day Punch Bag Workout Program. I’ve often looked on in awe (don’t tell them!) at the speed, power, and complex combinations and silently wondered ‘how the hell could I ever do that?’. That seems so far from anything I’m capable of doing. Reading about boxing training or watching boxing training video is not the same as actively participating – that I’m 100% sure about. Work – My Health & Fitness Dilemma. Okay this is me – I’m 42 years old, overweight (yes, you can say it – fat). I eat healthy diet but I like more than the ‘odd beer’ – I’m English, so drinking tea is a major activity – and biscuits might accompany ‘a nice cup of tea’ more often than not. My fitness – In all honesty, I don’t think I’ve ever really been ‘fit’. Sure, I’ve looked slimmer for short periods, ate healthy, lost weight. But I’ve also had more than my fair share of un-used gym memberships, and short-lived DVD workouts – in the end – all proving impractical, uninspiring or boring. I’ve given up and before you know it – back where I started. It terms of exercise nothing has really worked for me, except enjoying walking – good for strong legs and and a degree of endurance – but it’s no way near enough. And with my other main hobbies being photography and wildlife watching – I’m severely lacking in energetic pursuits! So, it comes as no surprise, my biggest worry is ‘inactivity’. We constantly read that ‘a sedentary lifestyle is killing us’. To make matters worse I work at home in the IT industry – which means many hours sitting in front of a screen, hammering away on the keyboard. I don’t have a commute to the office, so there’s not even the possibility of a walk or cycle. I’m ashamed to admit there have been days where I’ve not even left the house – these are entire days with practically no movement at all! When you start doing your ‘inactivity’ calculations – it quickly gets alarming. Let’s say over a 24 hour period, I spend 9 hours sitting at a desk, 8 hours sleeping, 2 to 3 hours watching TV, reading, an hour eating. There’s not a lot time left for the vigorous activity needed to redress the balance. And for me recently, it gets a little worse! A few months ago I moved to a new area and needed to register with the local medical centre. This involved a medical check up. Oh great! The stress of moving house, heavy workload and no exercise – this will be interesting. 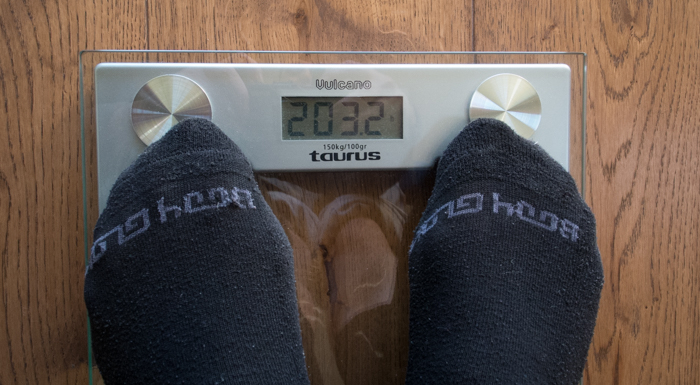 Weight – I’ve reached a new all time high, 203lbs (92kgs, 14.5stone). I knew it would be bad but that shocked me. I would normally hover around 185 to 190lbs. A hectic lifestyle plus indulgences at Christmas & New Year and I’ve somehow added 16lbs+, it’s now March and I’ve not lost any of it. Okay, may be the weight I could control. Cut back on food and alcohol – it would have some impact. I’m classed as a ‘Heavyweight’. But there was another whammy – high blood pressure. It measured 151/110. I remember below 120/80 was normal. 151/110 seems quite a bit above normal. The nurse looked at me “you’ll need to comeback in 2 weeks for a re-test, and perhaps have a blood pressure monitor!”. I left feeling very embarrassed. But I can’t say it was a ‘big wake up call’ – because I knew something had to change. You can’t carry on with months of no serious exercise, eat and drink what you like – and expect to get away with it. It’s caught up with me and consequences have stayed. 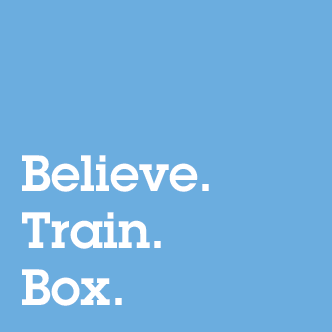 So, ironically I’ve been part of a team working to create a workout program that aims to provide the benefits of boxing training to a world audience – and here I am in desperate need of it too! It couldn’t have come at the better time. 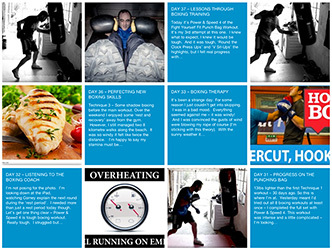 ‘Boxing training’ might not have been high on my list of things that ‘I wouldn’t mind doing that one day’ – But it is now! I’m nervous but looking forward to it, I think it might be one of the hardest things I’ve ever done. But what the hell … bring it on! Here’s to the next 60 days! P.S. – Oh, here’s my Day ‘Zero’. Preparing the ‘my home gym’ (there’s 3 words I never thought I’d ever say!). 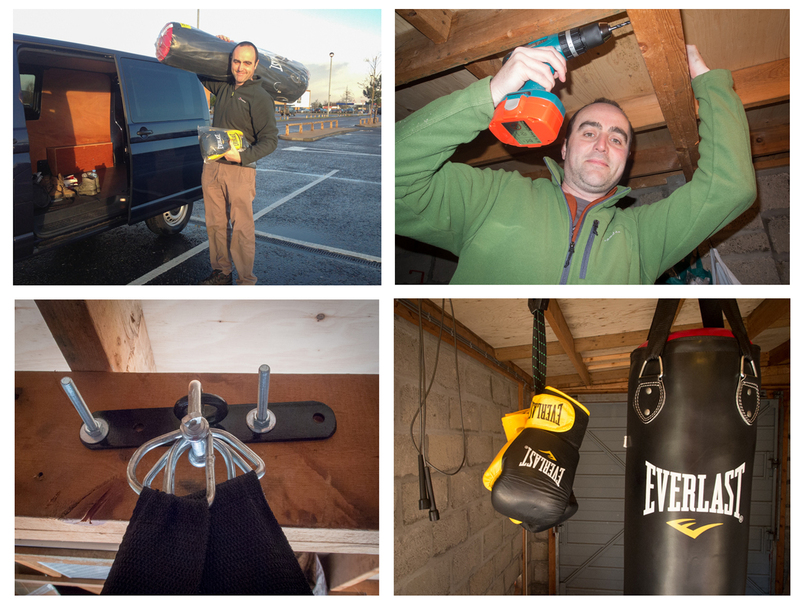 I went to the store – bought my punch bag, gloves and wraps – and rushed home to dig out the power drill! With bolts and a bracket bought on eBay I was up and running in no time. All ready for tomorrow and Day 1.